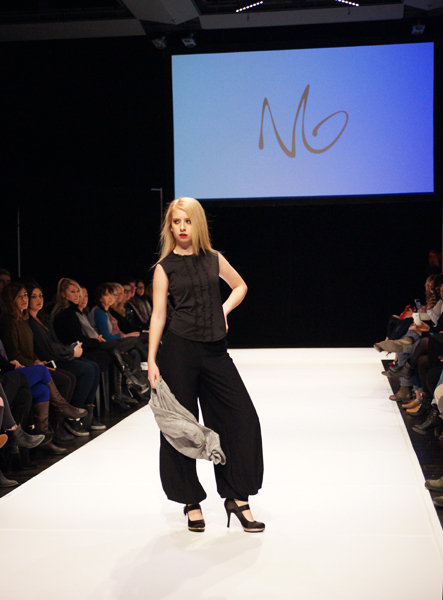 The Common Thread fashion show raised awareness about fair trade clothing by featuring ethically made and eco-friendly pieces from local designers on Jan. 20 in Toronto. Ideology of fairness is about clothes made with sustainable resources to secure healthy working conditions, protected environment and economic sufficiency. Fair trade is a movement for change that works directly with human rights, consumers, companies, business and environment. Mostly, designers got their fabrics from textile stores, thrift shops, garage sales and old clothing donations to make pieces for this fashion show. After finishing the school of fashion design, Julia didn’t want to work for another company, but to see what she can do on her own. She has been in fashion design for 10 years and has been sewing since she was young, but in the last two years she finally found her own direction in the fashion industry. She likes to think about comfort as well as mix and matching in many creative ways when she designs. “Each piece, I hope, you could wear in many different ways and will match with other items you have in your closet,” Welsh says. She finds the most challenging part of her job is to work on her visions and transform them into real pieces. Gabriel went to tailor school when he was 15 years old and decided to design his own pieces when he could not find what he was looking for in the stores. “I guess I have a different taste,” he says. In his collection, he focused on genderless design, street wear fashion and timeless clothing. “I feel like I don’t communicate well with words, I feel like I am better with visual language and fashion is my way to talk to people,” Ting says. His collection is a personal perspective towards his life, his mentality and himself. Every piece he made has an expressive value and meaning attached. “For me, sewing is the easiest part, but finding an identity in Toronto to bring myself up is really hard,” he says. Niki grew up around fashion designs. Her grandmother was a dressmaker and a tailor. When she was young, she started making dresses for her Barbie dolls. She finished art school and thought fashion design would be fun. “Fashion design wasn’t a serious choice, but when I got into it I really enjoyed it,” she says. The most enjoyable part of her work is “the feeling of getting to see someone wearing ... my clothes and it never gets old,” Niki says. She keeps her designs simple and usually uses cotton for her clothing. She doesn’t mass-produce; instead, she makes every piece from scratch and for a certain individual. She says that finding fabrics that come from ethical sources is the most challenging part of designing for her. Monah used to do illustrations, and last year she learnt how to sew, which inspired her to make her own original pieces. “My inspiration is my culture, hip-hop culture and just black culture in general. I am a West African. I try to put my cultural elements from fabrics in everyday wear,” she says. Being a fashion designer allows Monah to express her personality and connect her identify with her style. “I am sort of a shy person and when it comes to colour I don’t really take a lot of risk, but through my line I find that I am doing that more often with the material,” Water says. Cathleen has wanted to be a fashion designer for a while, but she was always scared to do it. But after participating in a fashion show in high school, it gave her an opening to showcase her work. “My clothing pieces are my babies. I am feeding them. They are growing and they make me grow as a person,” Calica says. She got the fabrics for this show from local stores, thrift stores and even garage sales. Some of them she has been collecting since high school. “Being self-conscious is the most challenging part while you design,” Cathleen adds. Dinah turns something people will consider garbage into a treasure. She incorporates old ties, funky patterns and interesting designs and puts them on the pockets or different parts of old sweatpants to create a whole new piece. Dinah gets all of their ties and patterns from local thrift shops and her friends donates their old sweatpants and old clothes to her. “By supporting local and recycled fashion I always end up with awesome unique pieces while supporting our environment,” she says.